Dorcas Koon Bennett, age 83, of Lincolnton, NC, died Tuesday, August 7, 2018 at Carolina Care Center in Cherryville, NC. and a native of Green Hill community. 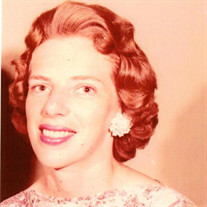 She was the widow of the late James Baxter Bennett Jr. Dorcas was a lifelong Southern Baptist. She raised her family in Monroe Georgia. She was preceded in death by three brothers and three sisters. James Baxter Bennett III and his wife Linda. One Granddaughter: Monika Bennett and her husband Robert Zibilske and a future great granddaughter Zibilske. The family will receive friends from 1:00 PM to 2:00 PM, Saturday, August 11, 2018 at Mountain Creek Baptst Church. The Funeral service will be at Mountain Creek Baptist Church at 2:00 PM, Saturday, August 11, 2018 with Reverend Charles McClure and Reverend Judy Drysdale officiating. Interment will be at Mountain Creek Baptist Church Cemetery. In lieu of flowers memorials may be made to Grace of God Rescue Mission; P.O. Box 212 Forest City, NC 28043.